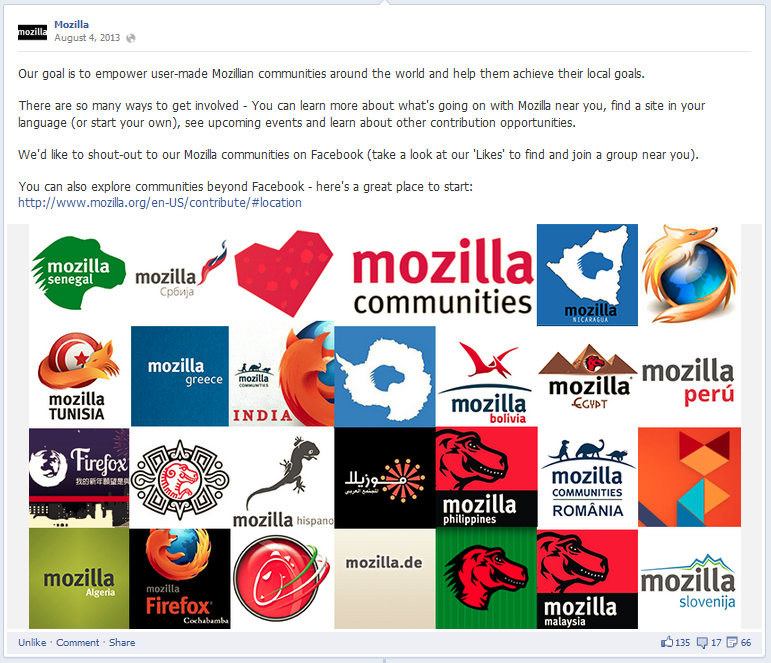 Building new social communities for Mozilla from the ground up. 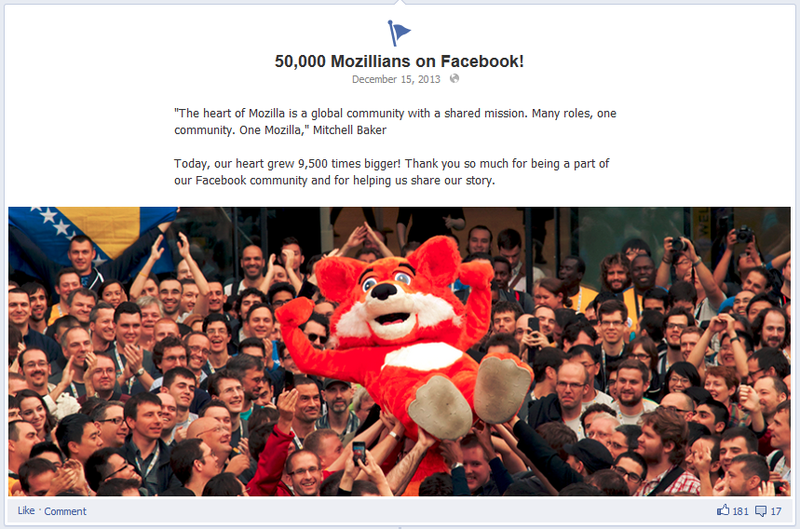 How did we bring Mozillian values into some of the most ‘walled gardens of content’ we know? I’m happy to paint the broad strokes, notable moments and results for you right here. Take a look at the links at the end for a deeper dive on how it all worked out, channel by channel. During my two years at Mozilla, I built new social communities on Facebook, Twitter, Tumblr and more for the Mozilla Foundation and for Webmaker.org. In those two years, my work attracted over 265,000 new followers on social media, primarily through engaging content, clear messaging and a robust publishing schedule. When I joined the Foundation in early 2012, it had a minimal social presence: one Twitter channel with 6,000 followers, a Facebook Page with only 303 Likes (and over a dozen competing and confusing fan pages), and no Tumblr. The challenge was to balance attracting new followers to contribute to and use new educational products like Webmaker.org and Lightbeam for Firefox, and to build a movement to raise support (and funds) based on our values and mission on the Mozilla channels. Our social strategy had to serve multiple goals ~ from welcoming individual contributors to our projects each day to sharing major breakthroughs from across the entire organization to the world at large ~ all the while scaling our growth upwards from within the fastest product development atmosphere I’ve ever encountered. My overall approach was to use traditional content-marketing tactics (for the forces of goodness!) 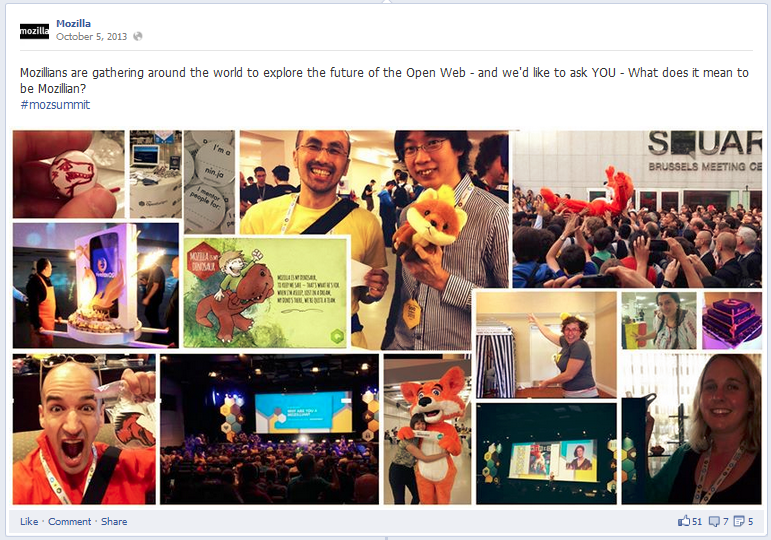 to build a strong communications platform for Mozilla on social media. I was able to create fresh opportunities to tell the Mozilla story, history and mission to a vast audience who were aware of Mozilla’s products (like Firefox) but perhaps had no idea Mozilla was a non-profit, that it engaged in political advocacy (SOPA & much more), that it is an Open Source project, or that volunteers help build their products. I wanted to focus on these stories, expose the incredibly diverse work we were engaged in, reach out to many thousands of people who share our values, and create opportunities to contribute to the cause. I worked with Facebook to establish a verified Page, set up new scheduling and tracking tools, created (and shut down in some cases) product channels to streamline messaging and support engagement teams, and coordinated with project teams to ensure I was bringing out the best from Mozilla. I built campaigns around our overall organizational objectives and programmed them across select channels to engage new and existing followers and to drive us towards aggressive growth targets I felt the Mozilla name deserved and warranted. I grew to understand each audience by listening to their interests, following their heroes, and striking up conversations when I found an opportunity. I also produced absolute gigabytes of custom content. We won those followers through earned media and sweat! Early on, I brought social media and website metrics analysis into my daily routine – which presented me with actionable insights about our follower’s demographics and interests, especially useful when building our Webmaker.org outreach strategy for global initiatives like Maker Party and for geo-targeted campaigns like MakeThingsDoStuff in the UK. I also kept track of moments when the metrics might lead to unexpected results or incorrect conclusions – such as when I learned that our Facebook channel had unusually high engagement centered in Egypt at one point in time. This turned out to be an active sub-community interested in discussing mobile devices and not the results of a recent privacy campaign – keeping track of the different influences on your global channels is important! A typical day in early 2013 might include capturing, editing and posting a video clip of Douglas Rushkoff speaking on a community call, promoting a global ‘Maker’ campaign in multiple timezones, finding and sharing six Webmaker projects made by young women learning code for the first time, tweeting back and forth with TechCrunch about a new product update, chatting with my MozRep buddy Gauthramraj about his letter from our executive director on Facebook, and chasing Wil Wheaton for a comment on Open Source on Tumblr. And learning to code a little better than the day before – always that! The work and preparation put into these channels was incredibly successful, as shown in the highlights below. Everything is important when you start from scratch – from small scale community get-togethers under the Webmaker brand, to large product and PR promotions like the Mozilla Festival, I found every possible opportunity to bring positive and relevant material back to the community and encouraged them to step onto our on-ramps every chance I got. 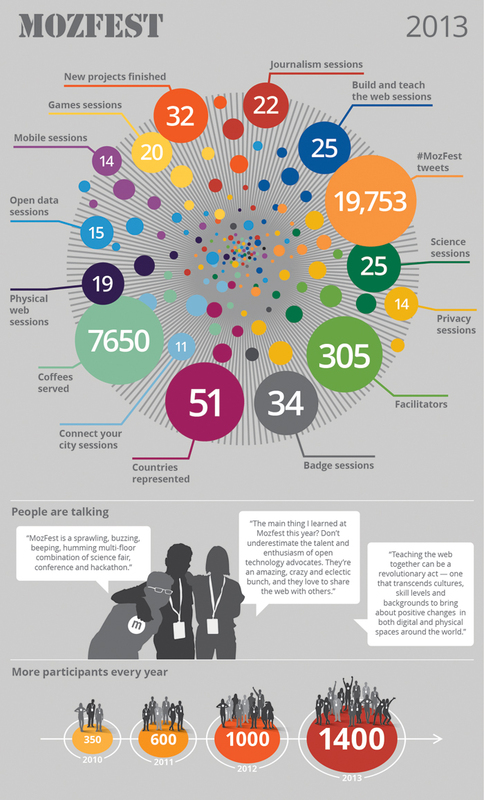 Our annual events became key opportunities to lead Mozilla’s best and brightest participants up the engagement ladder towards greater contribution and community participation. Talking to the entire world at once only works if you work hard at being a great listener. Supported community members at all possible times by promoting events and engagement opportunities, celebrating stellar efforts among our members, and reaching out for every possible conversational opportunity – and making great friends in the process! It’s been an absolute pleasure to grow you, Mozilla! 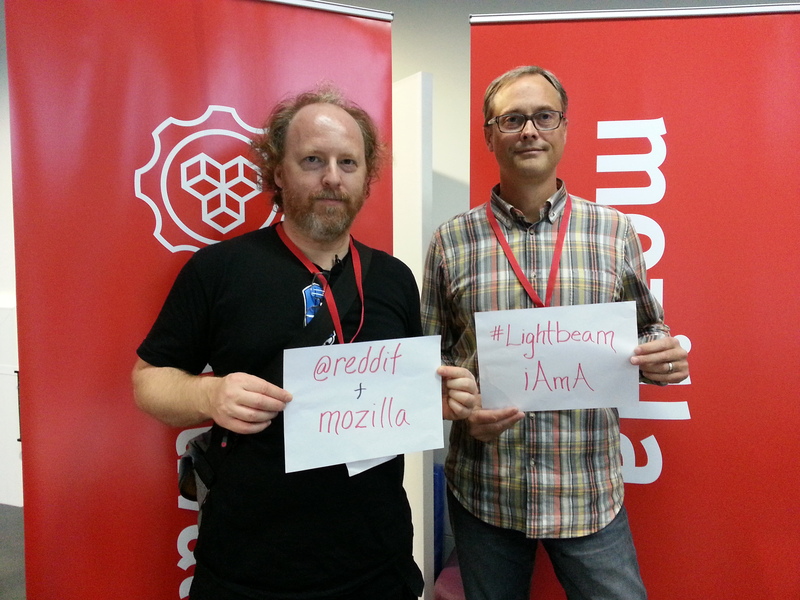 Dethe Elza and Alex Fowler provide their Reddit proof for my camera.